What problems does the actor model solve? In this chapter, we will integrate our device actors into a component that manages devices. When a new device comes online, there is no actor representing it. We need to be able to ask the device manager component to create a new device actor for us if necessary, in the required group (or return a reference to an already existing one). The device connects through some protocol to our system. The component managing network connections accept the connection. The ID of the device and the ID of the group that it belongs is acquired. The device manager component is asked to create a group and device actor for the given IDs (or return an existing one). The device actor (just been created or located) responds with an acknowledgment, at the same time exposing its ActorRef directly (by being the sender of the acknowledgment). The networking component now uses the ActorRef of the device directly, avoiding going through the component. The top level is the supervisor actor representing the component. It is also the entry point to look up or create group and device actors. Device group actors are supervisors of the devices belonging to the group. Apart from supervising the device actors they also provide extra services, like querying the temperature readings from all the devices available. Device actors manage all the interactions with the actual devices, storing temperature readings for example. When designing actor systems one of the main challenges is to decide on the granularity of the actors. For example, it would be perfectly possible to have only a single actor maintaining all the groups and devices in HashMaps for example. It would be also reasonable to keep the groups as separate actors, but keep device state simply inside the group actor. Allows us to isolate failures happening in a group. If a programmer error would happen in the single actor that keeps all state, it would be all wiped out once that actor is restarted affecting groups that are otherwise non-faulty. Simplifies the problem of querying all the devices belonging to a group (since it only contains state related to the given group). Increases the parallelism of the system by allowing to query multiple groups concurrently. Since groups have dedicated actors, all of them can run concurrently. Allows us to isolate failures happening in a device actor from the rest of the devices. Increases the parallelism of collecting temperature readings as actual network connections from different devices can talk to the individual device actors directly, reducing contention points. In practice, a system can be organized in multiple ways, all depending on the characteristics of the interactions between actors. Prefer larger granularity to smaller. Introducing more fine-grained actors than needed causes more problems than it solves. Prefer finer granularity if it enables higher concurrency in the system. Prefer finer granularity if actors need to handle complex conversations with other actors and hence have many states. We will see a very good example for this in the next chapter. Prefer finer granularity if there is too much state to keep around in one place compared to dividing into smaller actors. Prefer finer granularity if the current actor has multiple unrelated responsibilities that can fail and restored individually. DeviceManager receives the request to track a device for a given group and device. If the manager already has an actor for the device group, it forwards the request to it. Otherwise, it first creates a new one and then forwards the request. The DeviceGroup receives the request to register an actor for the given device. If the group already has an actor for the device, it forwards the request to it. Otherwise, it first creates a new one and then forwards the request. The device actor receives the request and acknowledges it to the original sender. Since the device actor is the sender of the acknowledgment, the receiver, i.e. the device, will be able to learn its ActorRef and send direct messages to its device actor in the future. As you see, in this case, we have not included a request ID field in the messages. Since registration is usually happening once, at the component that connects the system to some network protocol, we will usually have no use for the ID. Nevertheless, it is a good exercise to add this ID. We start implementing the protocol from the bottom first. In practice, both a top-down and bottom-up approach can work, but in our case, we benefit from the bottom-up approach as it allows us to immediately write tests for the new features without mocking out parts. At the bottom of our hierarchy are the Device actors. Their job in this registration process is rather simple, just reply to the registration request with an acknowledgment to the sender. We will assume that the sender of the registration message is preserved in the upper layers. We will show you in the next section how this can be achieved. We used a feature of scala pattern matching where we can match if a certain field equals to an expected value. 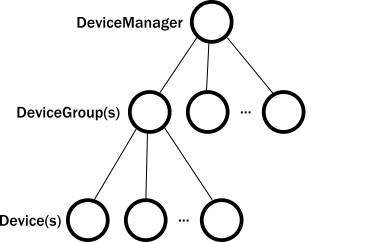 This is achieved by variables included in backticks, like `variable`, and it means that the pattern only match if it contains the value of variable in that position. We used the expectNoMsg() helper method from TestProbe TestKit. This assertion waits until the defined time-limit and fails if it receives any messages during this period. If no messages are received during the waiting period the assertion passes. It is usually a good idea to keep these timeouts low (but not too low) because they add significant test execution time otherwise. We are done with the registration support at the device level, now we have to implement it at the group level. A group has more work to do when it comes to registrations. It must either forward the request to an existing child, or it should create one. To be able to look up child actors by their device IDs we will use a Map[String, ActorRef] Map<String, ActorRef>. Just as we did with the device, we test this new functionality. We also test that the actors returned for the two different IDs are actually different, and we also attempt to record a temperature reading for each of the devices to see if the actors are responding. So far, we have implemented everything for registering device actors in the group. Devices come and go, however, so we will need a way to remove those from the Map[String, ActorRef] Map<String, ActorRef>. We will assume that when a device is removed, its corresponding device actor is simply stopped. We need some way for the parent to be notified when one of the device actors are stopped. Unfortunately, supervision will not help because it is used for error scenarios, not graceful stopping. Whenever we create a new device actor, we must also watch it. When we are notified that a device actor has been stopped we also need to remove it from the Map[String, ActorRef] Map<String, ActorRef> which maps devices to device actors. Stopping a device actor from our test case, from the outside: any actor can be stopped by simply sending a special the built-in message, PoisonPill, which instructs the actor to stop. Be notified once the device actor is stopped: we can use the Death Watch facility for this purpose, too. Thankfully the TestProbe TestKit has two messages that we can easily use, watch() to watch a specific actor, and expectTerminated to assert that the watched actor has been terminated. We leave tests of the device manager as an exercise as it is very similar to the tests we have written for the group actor. Delegate-respond (for registration of devices). Create-watch-terminate (for creating the group and device actor as children). In the next chapter, we will introduce group query capabilities, which will establish a new conversation pattern of scatter-gather. In particular, we will implement the functionality that allows users to query the status of all the devices belonging to a group.